After completing the activity on the previous page, you saw that the following table of data was collected from the experiments. 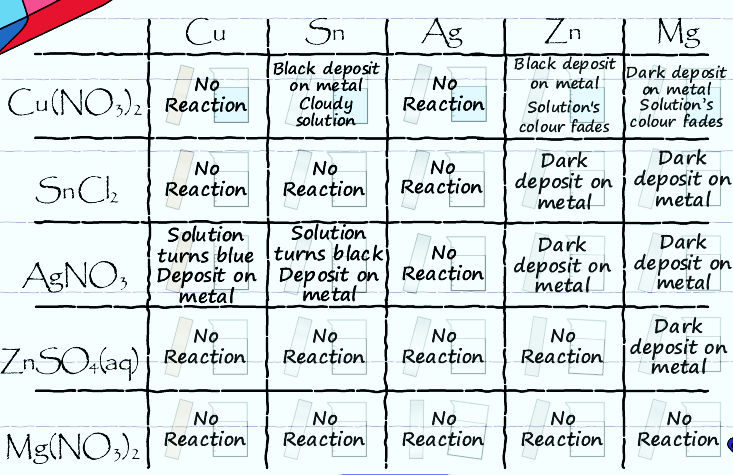 Use the data in this table to answer the following questions about how the metal ions reacted. Based on the table of data, can you arrange the metal ions in the list below from the ion that has the highest tendency to undergo reduction to ion that has the least tendency to undergo reduction? Looking at the table, which metal ion plated out on every other metal? Silver ion plated out as silver on every other metal, so it is the most reactive. Refer back to the table to determine which metal ions are more and less reactive. The order of metal ions from most to least reactive is: Ag+, Cu2+, Sn2+, Zn2+ and Mg2+.